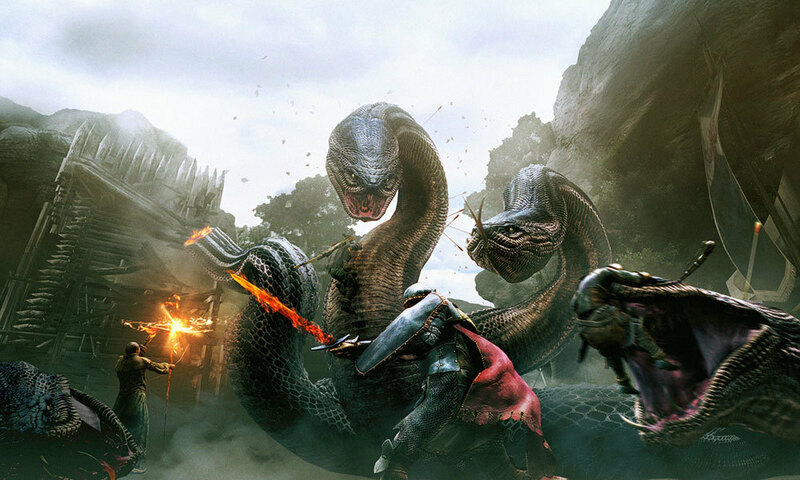 Dragon’s Dogma, Capcom’s new open-world fantasy game, is impressive and fumbling in equal measure. Its combat and dungeon-crawling is generally pretty exceptional, but it’s brought down time and time again by innumerable stupid little problems. The first few hours of the game are extremely tedious, the inventory system is clunky and unhelpful, and so on. As such I find myself swinging between bouncing off the game after fifteen minutes of frustrating play and sitting engrossed for hours at a time. But while I can get over most of these small issues, and while I can grit my teeth and accept that sometimes my AI team mates see fit to leap from a cliff to their deaths, I can’t quite get over the writing in this game. It’s terrible. No, really – it’s some of the worst I’ve seen in a long time. NPCs are limp cut-out mannequins, the setting is a poorly fleshed-out generic fantasy kingdom, and everyone speaks in a faux-historical Ye Olde English style that grates within less than a minute of selecting ‘Start New Game’. And there’s literally no reason it has to be like this. I’m not asking for great literature here – I just want a game world that doesn’t actively goad me into turning my console off and walking away. In most cases, when a game has nothing to show for itself in the writing department it dutifully keeps quiet and focuses on the things it does well. Dragon’s Dogma on the other hand is obsessed with pushing its dumb world and dialogue into your face whenever it gets the opportunity. Characters have so much to say, none of it interesting, and the game is fond of making you sit through long, tedious cutscenes that never serve any purpose. And your AI team mates just never shut up. This is usually inane and unhelpful, and there was even one point early on where every single time I passed by a particular tree along a major road all three of my team mates would simultaneously say ‘I have never seen a tree so tall’. Now, poor quality writing is nothing new in games, though I’d argue that if you look in the right places you’ll find the problem’s not nearly as widespread as people often claim. And this definitely isn’t the worst I’ve ever seen. But still, the fact that the game seems so happy to tarnish a brilliant open-world role-playing experience with unavoidable, terrible prose and world-building makes me want to grab it and rub its nose in the mess it’s made to teach it a lesson. If Dragon’s Dogma had simply kept all its terrible writing in the background where it wouldn’t bother me I would have enjoyed it a great deal more. But my contention has always been that good writing will always make a game far better than it otherwise would have been*, and I think that holds true here. A Dragon’s Dogma with next to no writing would have been far better than the game we got. But great writing – an imaginative fictional world, interesting characters, and compelling dialogue – would have made Dragon’s Dogma even better still. And this is true for pretty much any kind of game, not to mention the many games that have storytelling and the written word at their very heart – games like Fallen London, King of Dragon Pass, and innumerable text adventures from decades of talented writers. And I would love to play a Dragon’s Dogma bolstered by great writing, but since that isn’t going to happen I’ll just have to be content with turning the volume down and listening to podcasts to drown out the sound of my companions telling me how dark this cave is for the seventh time in a row. * I think only purely abstract games like Tetris, Chess, Minesweeper, and the like serve as exceptions to this rule. This entry was posted in Games Blather and tagged Capcom, Dragon's Dogma, Games Writing. Bookmark the permalink. Hah. Upon finishing this game I was Googling for the writing team behind this debacle, found your blog. Just thought I’d nod my head in complete agreement. They churned out tons and tons of text for this thing, most NPCs take forever to voice their utterly banal and uninteresting opinions, while I loved the game I couldn’t help but shake my head at all that wasted time and effort, again and again. I also think awful expositions are endemic to Japanese games/anime. (Not awful writing in general, which can emanate from any part of the world, but even the best Japanese writing in games seems to be bogged down by needless exposition). Normally that is offset by having strong characters indulging in that exposition, and the story having an emotional core (often to the point of melodrama, but that’s not necessarily or always bad). This game has all the worst pitfalls of Japanese writing without any of the merits. I would disagree. In fact Dragon’s Dogma as a product is a bit of an Oracle. I would like to speak with From Software including the writing team on pulling off, whether by accident or purpose a game that with time will become near impossible to see all of. This in my opinion is the Dogma of the Dragon that human beings will go to whatever lengths necessary for achievement that is neither new nor lasting in it’s satisfaction. We relish the journey.